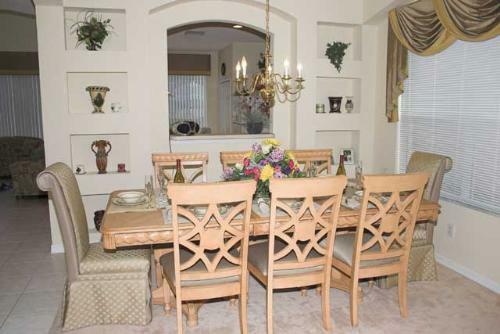 6 bedroom, 5.5 bathroom villa in the Terra Verde Resort community. Owned by Camilla Heron. Ref: 1414. We are Neil & Camilla Heron and have a son Alex and daughter Marissa. We own both Sunshine Villa and Sundance Villa. Sunbeam Villa and Sunray Villa are owned by other family members, however we arrange all the booking and administration of the villas on their behalf. We live in Dorset in England, although Neil is originally from Scotland. We met whilst we both worked for a major airline based at London Heathrow, but Camilla had to stop flying when Alex came along. 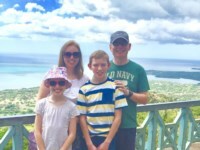 Looking for an alternative to flying that Camilla could use her knowledge of travel and customer service, whilst being able to work from home, we bought and started renting our first overseas property - Sunshine Villa. We previously had experience renting property in the UK with corporate long term lets to Computer Associates and Honda F1 Racing employees. With our experience in both property rentals and the travel industry put to good use, we soon found that we could not meet the demand for Sunshine Villa, especially during peak seasons, so decided to invest in a second home - Sundance Villa. As we were also getting lots of enquiries from our previous guests that had rented Sunshine Villa with their extended families but wanted to return on their own and didn't need such a large home, we decided to go for a smaller 4 bedroom villa but to make it even more luxurious inside. 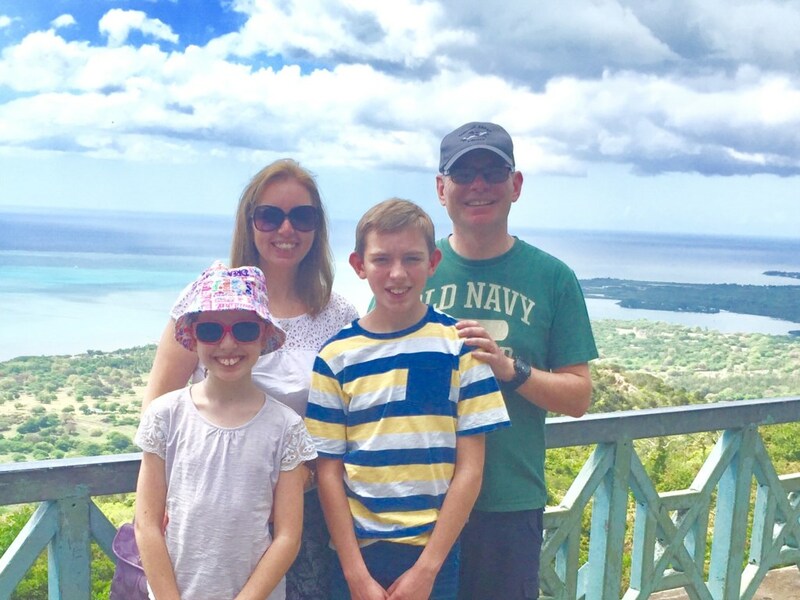 We particularly aim to cater in our villas for families, especially with younger children, as we know from our own experience that providing some of the extra facilities we offer can take the stress out of the travelling and make a more enjoyable vacation for everyone. Sunshine villa boasts an oversized pool of 30ft by 14ft. 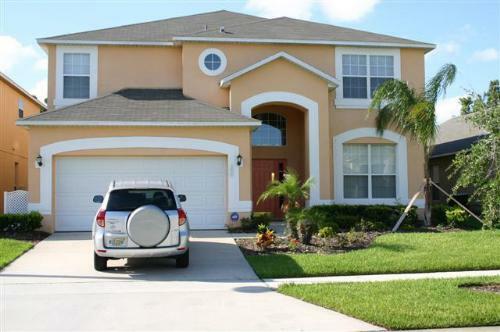 It has an adjoining spa and large surrounding deck. The sparkling pool is perfect for any time of the day and even has lights for a late evening swim after an exciting but hectic day out and about! 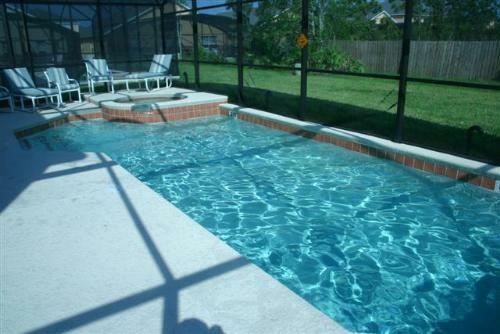 No matter what your age you are sure to enjoy the pool and surrounding outside area. 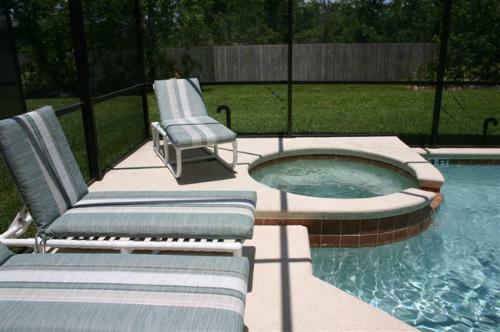 The pool is covered with a mesh lanei which lets the sun shine down on you but keeps the bugs out! 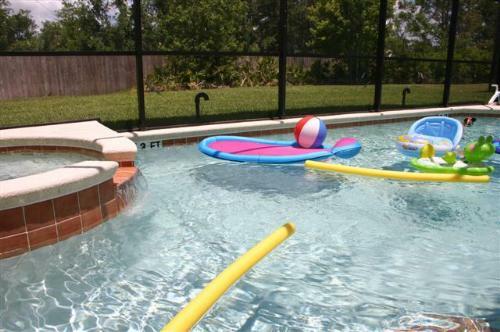 In accordance to Florida state law there is a safety fence across the length of the deck so to protect children from falling in the pool if they wander outside without an adult present. There are several padded loungers for you to relax your days away as well as chairs, recliners and 2 tables with a parasol – so alfresco dining is easy to enjoy. There is an outdoor grill and we also supply plenty of outdoor table ware so you can alfresco with ease. Remember to leave those bulky pool towels at home as we provide all of those too! Our fully stocked games room will keep the younger members of your party (and those still young at heart) safely amused for hours. Enjoy the challenge of a games evening, and hone your skills on our fabulous equipment. Will it be pool, table tennis, air hockey, electronic safety darts or the vast array of board games that are provided to keep you occupied ? For the more outdoorsy sportsman or sportswoman, there are even two sets of standard golf clubs for you to enjoy and a large selection of pool toys and inflatables. Of course the major part of any Disney vacation is keeping the children amused and happy when they are away from those amazing theme parks. 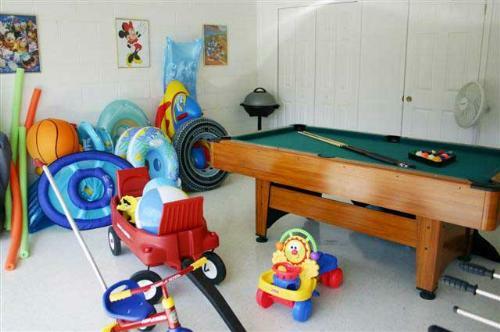 To this end, we have provided a huge assortment of games, toys and other amenities to make sure that our younger guests are particularly well catered for. These include a Playstation 2 with games, DVD movie selection, a fully stocked toy box, pool toys, board games, infant equipment including a stroller, sit and stand double stroller, two cots/cribs, bed rail, monitor, bath, bath seat, stair gates, high chair, booster seat, safety fence on pool deck, pool door alarm, child’s tricycle and wagon. Located just as you enter our beautiful home, and with the added bonus of it’s own indoor “weather station”, to help you plan your days, the formal “quiet” lounge room is an ideal place for adults to relax, unwind and maybe catch up with a little reading or other quiet past time whilst the rest of the party enjoy themselves elsewhere in the house. The muted pastel shades of our light and airy family room, provide a convenient central “meeting point” for your party at any time of the day or night. In this room, we have provided a stunning large screen cable TV, an RCA 5 disc changer DVD home theatre system, a VHS player, a selection of books, board games and a stash of DVD movies for our guests to enjoy. 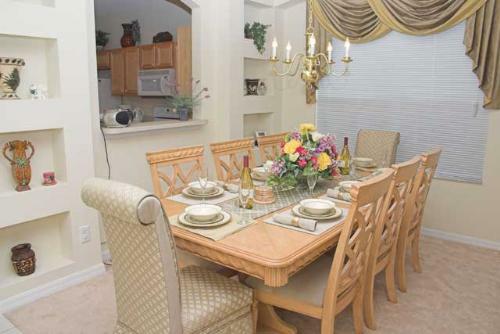 Is it any wonder this fabulous room is so popular? The den is always a favourite “hide away” place and is ideally located on the first floor, so as to be just far enough away from the parents who will appreciate a little “down time” after a full day of exploring those magical theme parks. Kitted out as a mini office and combined “chill out” space, this great room features a designated TV for the PS2 games console and has casual floor cushions which are ideal for lazing around on and great for comfortably getting into the on screen action. 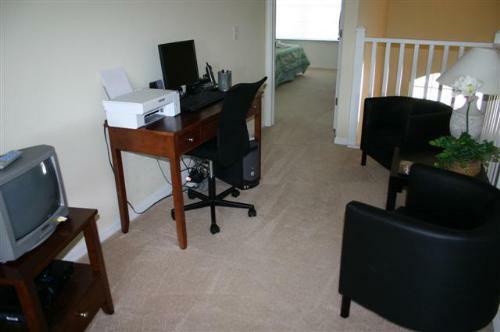 Other amenities of this room include a desk, desktop pc with free high speed internet connection, a printer/copier/scanner and even pens and postcards so you can tell everyone back home what an amazing vacation you are having! The latest update to this area, are twin tub chairs and a coffee table so that all the family can chill out or challenge each other with a game or two! It is extremely rare to find a vacation home which features as part of it’s 6 bedrooms, 4 master bedroom suites, but by now, we think you will have realised that nothing about this unbelievable home conforms to the constraints of normality when it comes to good taste and quality for your perfect vacation. All of the bedrooms and bathrooms at Sunshine Villa have been designed and themed with comfort, style and convenience firmly at the forefront of our mind. 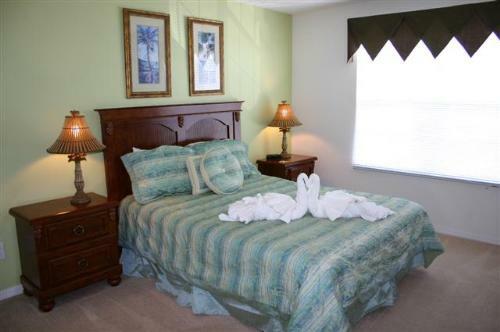 Each bedroom features the finest furnishings, upgraded mattresses, fine bed linens and decorative accents to give you that home from home feeling as well as a touch of Floridian luxury. 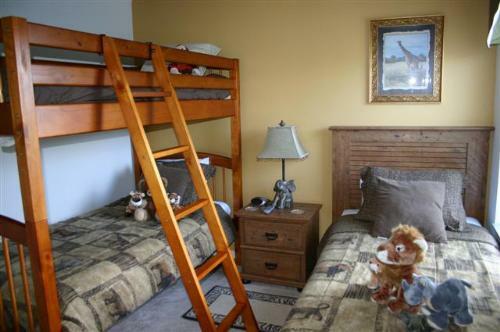 Every bedroom has the convenience of it’s own cable TV and DVD player making them the perfect place to escape and relax after a busy day of park hopping! 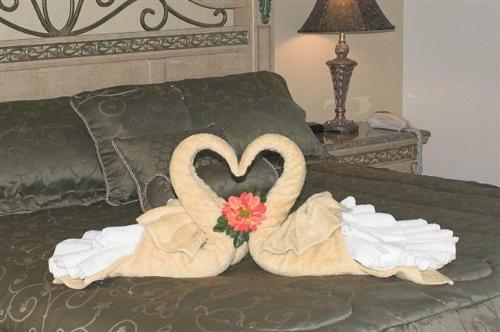 Our bathrooms are crisp, clean and welcoming, and like the bed linens, the towels provided throughout Sunshine Villa are all of the finest quality. 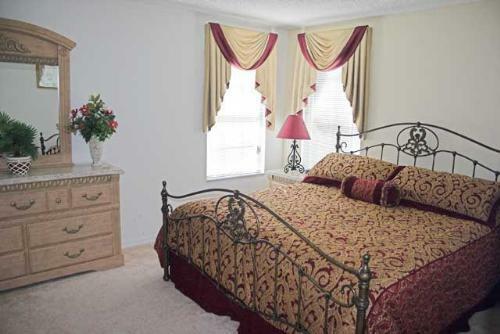 Beds 1 – 4 : All Master Bedrooms are complete with Master Bathroom Suites. Bedroom 1 (Ground Floor) contains a king size half poster bed, whilst master suite 2 provides an elegant metal framed king size bed. 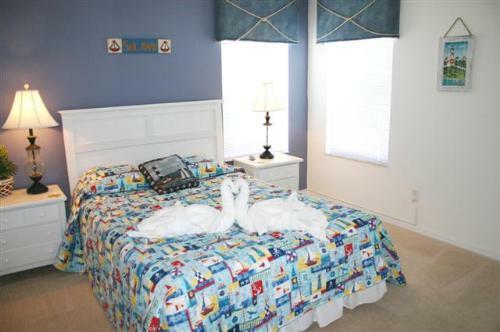 The remaining two en suite master bedrooms each feature luxurious queen size beds and are known as the Palm room suite and the nautical suite room with their own stylish bathrooms in keeping with the theme. 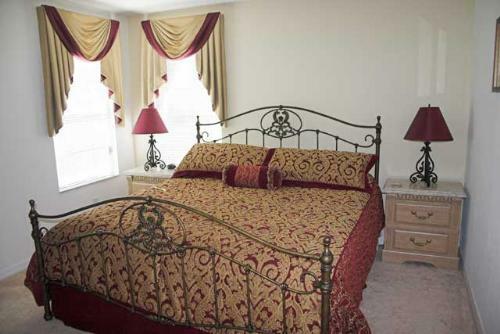 Beds 5 & 6 : Themed twin bedded rooms which share a bathroom. 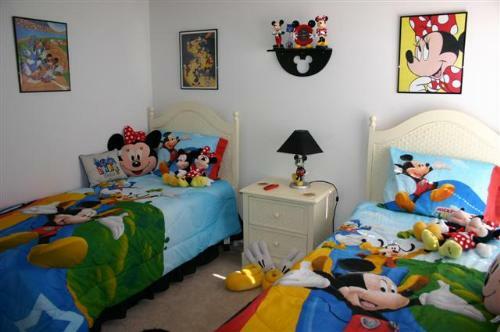 Bed 5 is a gorgeous Mickey and Minnie themed room complete with it’s own charming “Mickey TV”, whilst Bed 6 has a more grown up “safari” theme, reminiscent of Disney’s Animal Kingdom. Our fully equipped, modern, open plan kitchen is the heart of Sunshine Villa, and is fully stocked with all the labour saving devices you would expect in a real home style kitchen. Brand name appliances range from fridge freezers to toasters and pretty much everything in between. Whether it’s a simple snack or a full family dinner, you’ll find everything you need to create a perfect meal every time. And when it comes to dining locations, you will be spoilt for choice. Whilst our formal dining room exudes a sense of style and class, our more casual nook dining area is ideal for something a little more laid back. Top of the list however, is the al fresco delight of poolside dining utilising the two weatherproof tables and complimenting chairs. Full laundry facilities are located in the utility room and will ensure that you can quickly and easily launder your clothes and keep the whole family looking spotless! 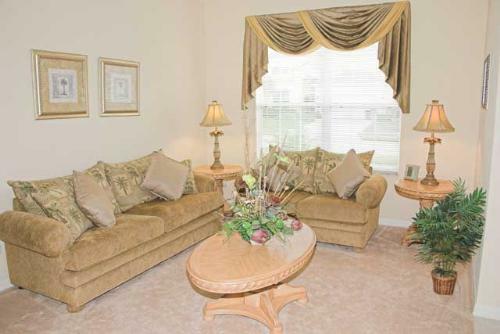 Widely acclaimed as one of the premiere five star resort communities in the Disney area of central Florida, Terra Verde will simply overwhelm you with it’s vast array of family friendly facilities and essential services. Whatever it may be, we guarantee that you will be delighted with the facilities provided for your enjoyment, which include a fabulous club house, large community pool and spa with poolside wireless internet access, a tikki bar for a relaxing drink by the pool, children’s playground with climbing rock, a man made beach complete with swaying hammocks, a fully stocked fishing lake, a half size basketball court, sand volley ball court, gymnasium, a sauna and even a friendly concierge service. Why would you want to stay anywhere else when Terra Verde offers so much ? Terra Verde Resort is built by the same company that built the sister resorts of Solana and Emerald Island. After reading this, we are confident that this will be just the start of your vacation. With everything that Sunshine Villa has to offer as well Terra Verde we believe that you will truly be bowled over by the fabulous opportunity of opulent living we present for you for that dream trip and it will be the first of many enjoyable stays in Sunshine Villa. We really do have the perfect location for your dream vacation! Stores : 24/7 Super WalMart, Super Target, Publix grocery store, Dunkin Donuts, Pharmacy. I just wanted to drop you a quick line to let you know that we had a brilliant holiday, we didn't want to come home. The kids say it is the best holiday they have ever had and are already asking when we can go again. Firstly I must tell you we thought the villa was fabulous, beautifully decorated, every convenience and the pool/spa was a big hit. We used the pool nearly every day and the kids spent hours in there, often going in as soon as they got up. Having use of the internet was a real asset it enabled us to look up such things as park info and the weather so that we could plan our days. We were also able to look at the photos we had taken. The villa is in a great location and we had no problems finding our way around. I will finish off by thanking you for all your help and complimenting you on your excellent customer service. It has been a pleasure." “We loved the villa from the moment we opened the front door. As a family with young children we felt our needs were catered for extremely well and a lot of thought had been put into the extras contained within the house itself. “We have just thoroughly enjoyed a wonderful holiday in a home which can only be described as luxury. 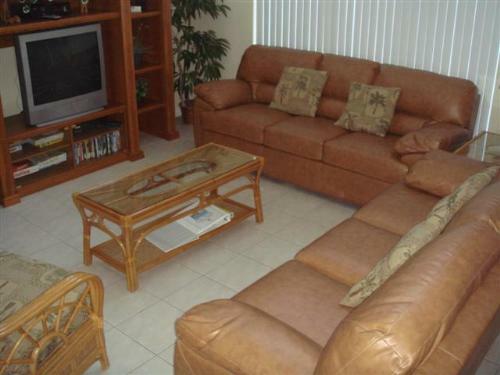 “A superbly furnished and well thought out villa. We have very limited availability remaining for 2007 and 2008 is booking up fast, particularly over school breaks and holiday periods. Please contact us as soon as possible if you wish us to hold dates for you, or make a reservation. For remaining dates in 2007 we may be able to offer a special deal - please contact us for details. All descriptive text & photographs are the copyright of the owners and may not be used, copied or reproduced in any form under any circumstances. Copyright © Camilla & Neil Heron 2016. All Rights Reserved. Low season prices from $1500.00 / £800.00 per week. Peak season prices from $2400.00 / £1200.00 per week. Pool Heater is an additional £15/$25 per day. Stays of less than 7 nights may be subject to a cleaning charge of $110. Additional nights are charged pro rata weekly rates. All prices are inclusive of 13% tax. This is payable no matter where the booking is made, and despite what some other owners may claim. We are happy to provide a copy of our tax receipts to show that this does get past on by us to the tax collector! Your enquiry will be sent to villa ref 1414 only. This page has been viewed 56286 times since 12 Aug 2004.